Suggested levels for this lesson are second through fifth grades. Lesson Overview: - There are two parts to this lesson. 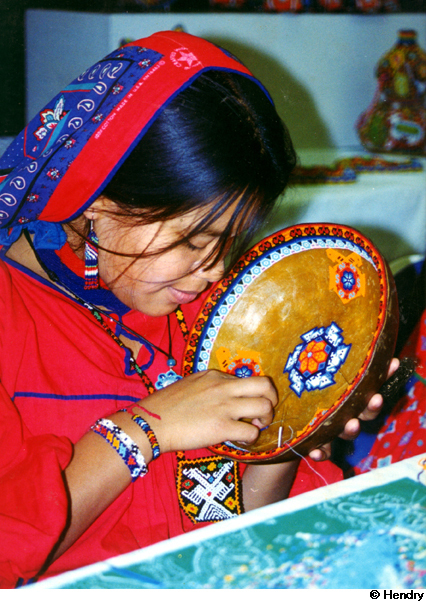 The first part introduces the students to another Huichol art form called jicaras. Jicaras are native bowls made from gourds, in which the inside (and sometime outside) of the bowl is decorated with beads adhered to the gourd by applying a mixture of tree resin and bees wax. These are used to make wishes (secure good health and a good harvest), or to honor a particular object, animal, or anything else in their realm of experience. These native bowls are left at Huichol sacred places: caves, temples, and along paths on the Huichol pilgrimage to Wirikuta. Kukas are small three-dimensional forms that are carved out of wood then covered with beads in the same manner as the gourd bowls. 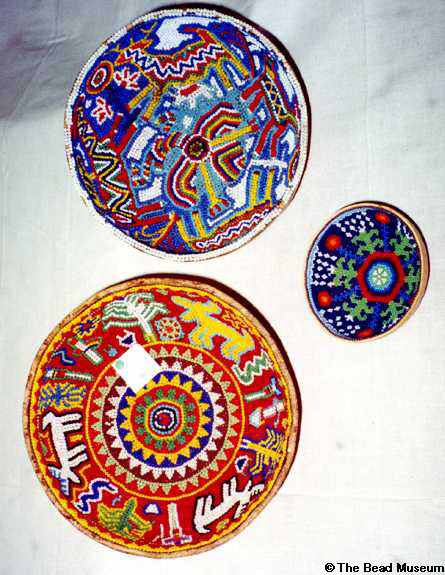 These are primarily used as sale items to provide income for the Huichol and family. Deriving images from their own experience, the students will learn to make their beaded objects. The second part of the lesson incorporates an earlier material used in the decoration of jicaras--seeds. Using a variety of seeds native to Huichol culture (and many other native cultures), the students will plant their own garden. 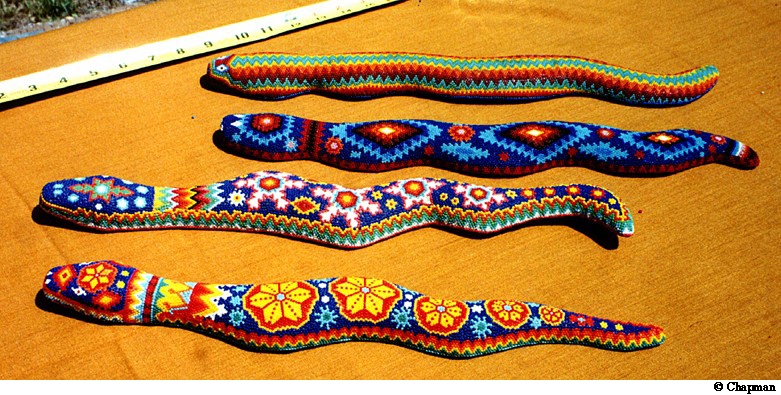 The three most important seeds in the Huichol culture include maize, beans, and squash. When maize (corn) and beans are planted together the growing process for the different plants is more efficiently sustained by the support of the bean plants entwined around the corn. The students will learn that a tiny seed holds a giant future, just as they do. 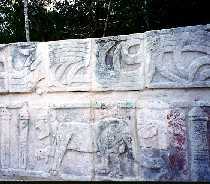 ...the Huicholes honor and celebrate the interconnectedness of all living things (meaning that we are connected to our world and everything in it) through ritual and the artworks they create. An example of this dependency is found in the food chain/the cycle of life. ...the Huicholes depend on their maize (corn) crops and try to keep everything in balance in order to secure a good harvest. This balance is achieved by offering the deities gifts of artful creations at sacred sites: caves, villages, temples and along pilgrimage paths. These gifts are not only offerings of thanksgiving, but petitions asking for the deities continued help in growing their crops and keeping them healthy. ...the Huicholes believe that they are dependent on maize for their food supply and maize is dependent on them for survival, else it will not grow on its own. 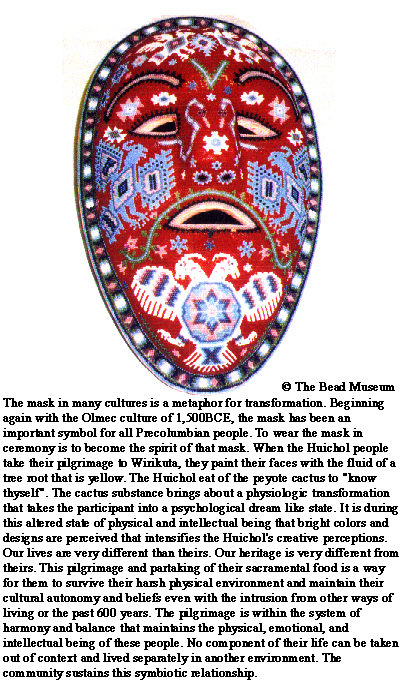 Again, part of the Huichol belief system is the idea that the Huicholes are on the earth to tend the earth and receive their sustenance from the earth. As the reciprocal of this relationship with the deities, when the Huichol dies his/her spiritual body goes into the cosmos to feed the being of the spirits. There is balance and harmony in this cycle of life. 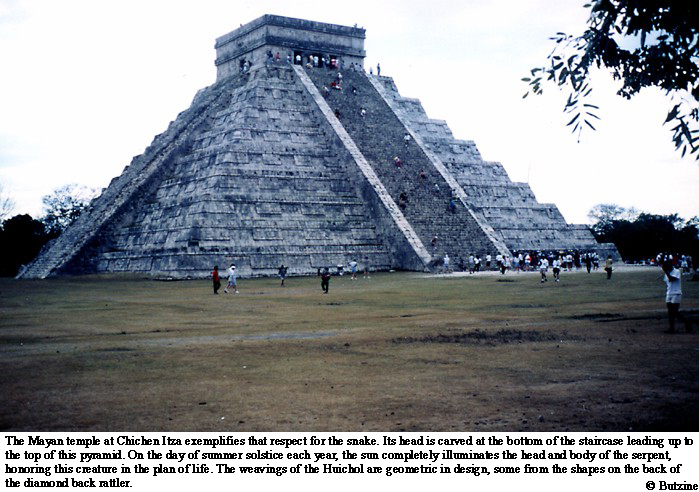 ...the Huicholes measure time in cycles (v. linear time). There is a planting season and a harvesting time. Explain that if seeds are not planted during this special time, the crops will not grow. And in turn, if the crops are not harvested during the allotted time, the crops will rot or be eaten by other animals. As a metaphor for the seed/bead relationship: the seed is planted and tended, harvested, then eaten to feed the physical body. The beads are decoratively placed in the gourd bowl to communicate a wish or prayer to the deities. These beliefs nourish the emotional and the intellectual components of the Huichol body, the mind. The Huichol believe that just as one drinks water from the gourd bowl, the deities drink from the decorated bowl and better understand the prayers of the Huichol who made the jicaras. 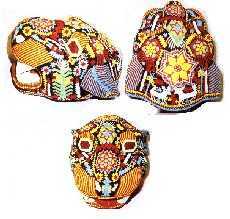 ...the Huichol currently decorate bowls made of gourds with many tiny glass beads. The earliest examples of jicaras were decorated with seeds, stones, and other materials from nature. Examples of these are in the Museum of Natural History in New York City. 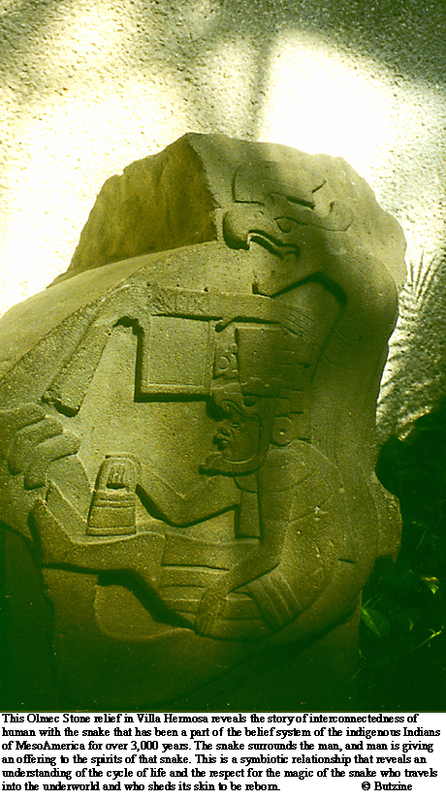 After contact with the Spanish, jicaras were embellished further with glass beads, coins, yarn as well as, the continuing use of stones, seeds and materials from nature. These bowls are called jicaras, and are used as ways of honoring ancestors and making wishes to keep balance and appease nature deities in order to secure a good harvest. Other wishes include a good hunt, rain, and the health of their family. ...as finer, smaller beads were imported into the Huichol environment, more detailed works evolved using symbols from their myths. Not only are beads adhered to gourds with a mixture of tree resin and bees wax, but wooden forms in the shapes of masks, snakes, dolls, small animals, jaguar heads, and other three-dimensional forms are created and decorated with symbols created from beads. These are called kukas. 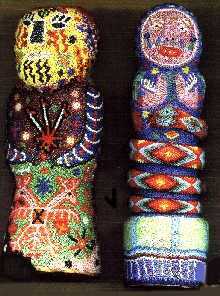 ...the Huichol beliefs and rituals influence the patterns, symbols, and colors used in the production of their art. 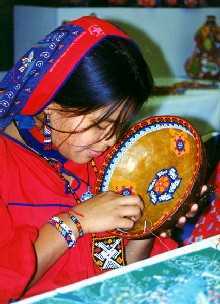 ...using their oral traditions, Huicholes use and preserve their culture through art making activities similar to what books do in Western cultures. ...using beads, students make their own beaded objects. ...through reflection and participant design the student may convey a personal message. ...how to use complementary colors in designing their beaded artwork. 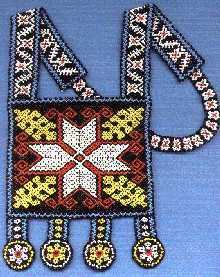 ...that symbols used to create the beaded art do not have to be realistic. ...through public exhibition at ASU West Fletcher Library that these artful objects, created by the students, have value in the community where they were made. To begin the lesson show the participants images of the jicara and kukas, attached to this lesson. These can be downloaded and adhered to a poster board for easy viewing. Ask the children to describe what they are looking at. 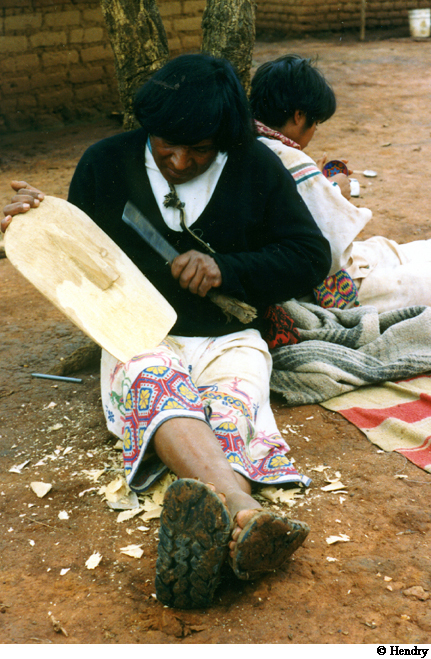 What materials are used in the construction of the jicara and kukas? What colors and designs does one see? Does anyone know who makes this art, and where these people live? Does anyone know what these art objects are used for? Could the same purpose for their creation be something that a child in the classroom might make for a similar purpose? 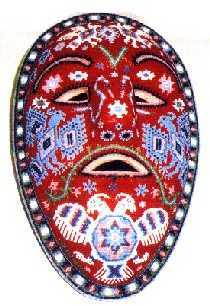 After viewing a variety of jicaras and kukas images from this lesson, inform the students that for these art forms, the Huicholes turn to their own experiences of the world and use these experiences as a source of inspiration. 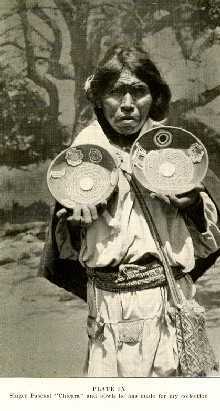 Explain that until recently the Huichol did not have a written language. They pass down their history and myths through the designs seen in these artworks. Continue asking the students to describe the imagery viewed in the art objects. Have the children describe some important symbols that have meaning for them. 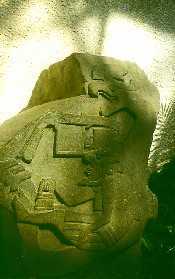 Then talk about the fact that since the beginning of time, people have used symbols to communicate ideas. It is believed that the cave drawings were also a means for those persons to leave behind their thoughts. Have the children sketch their own symbols of ideas they want to convey. If gourds are not available, students may again use cardboard or styrofoam forms to design their beaded art object in flattened shapes or three dimensional form. Ask students to lightly draw their images onto the material being used. Brush on Elmer's glue in the areas they will first work. 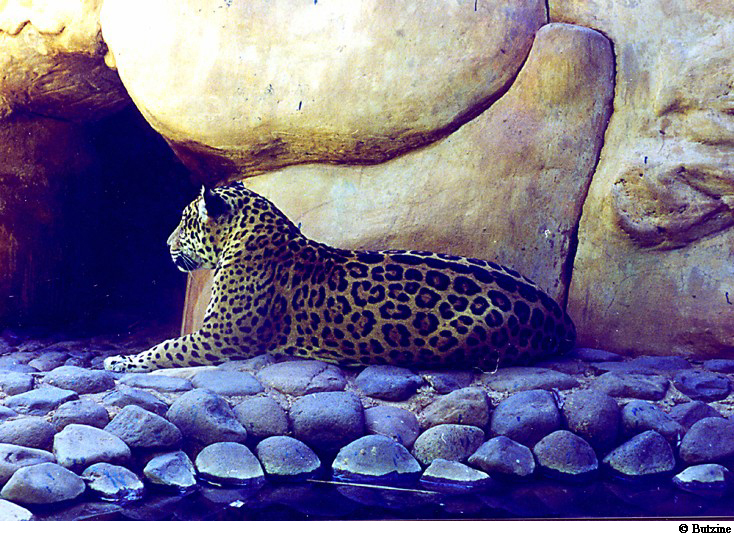 It is best to outline the image or images on the form with a framing of beads before the rest is filled in. In observing the colors used in the Huichol images of jicaras and kukas, note that the use of color and symbol designs are not necessarily realistic. There are many brightly colored beads of a uniform size throughout the composition. Point out the placement of "hot" colors (red, yellows, and oranges) next to "cool" colors (blue, green turquoise). This technique helps the shapes stand out and appear as if they glow. White and black beads are also used. Use beads and other objects (seeds, small pebbles or small trinkets) if desired to fill in the images. Have the students begin in the middle of their symbol and work outwards. If using a gourd, outline the rim first with the glue mixture, and then place the beads around the lip. One can use a small needle to gather up and stack multiple beads to be placed individually onto the form. Make sure there are no exposed areas. Afterwards, set to dry. Have the students talk about their creations with their peers. What is the art object's message to the viewer or the reason it was created.? Exhibit these beaded objects in a community space, outside the classroom. Activities Part Two - Students will plant and till a garden of corn. Read out loud to the students the book Corn is Maize. Depending upon the age of the children it would be preferred to pass the book around to be read by many students. Information on each page can be discussed as the book is being read. Explain to students that maize (corn) depends on humans for survival. Also inform students that maize is very important in the sustenance of life for many agrarian cultures. This means that there is a very special relationship between corn and people--corn needs humans to survive, communities need corn to survive, and both are dependent on the forces of nature. After reading the book, ask students if they can name some of the foods they have eaten that are made with corn. These include (but not limited to) tamales, tacos, tortillas, and popcorn. 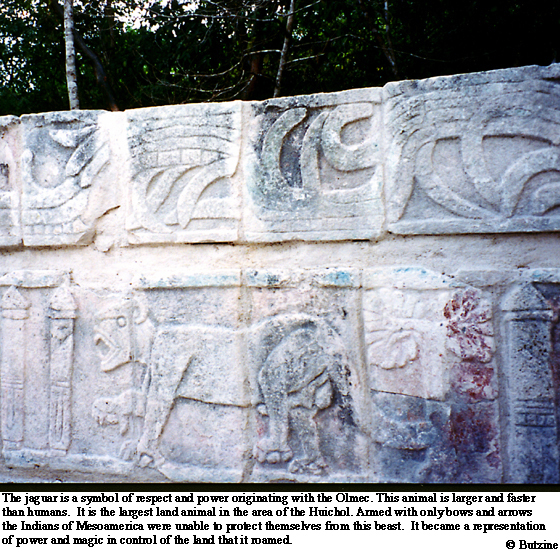 All the afore mentioned foods are ancient tribal foods of Mesoamerica and still exist as very traditional daily dishes. In the barrios of Phoenix communities, there are vendors at shopping areas that sell hot corn to be eaten as if one eats ice cream. It is a special treat. For planting a garden see the book for instructions. 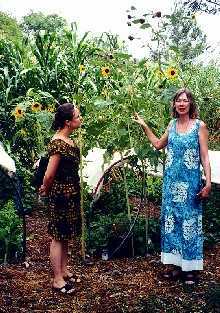 If the classroom is conducive to planting a garden in plastic cups or planters or even an area outside, the instructions are provided in this same story. It is always a wonderful activity to watch a seed sprout and mature. This sense of growth and nurturing is important. 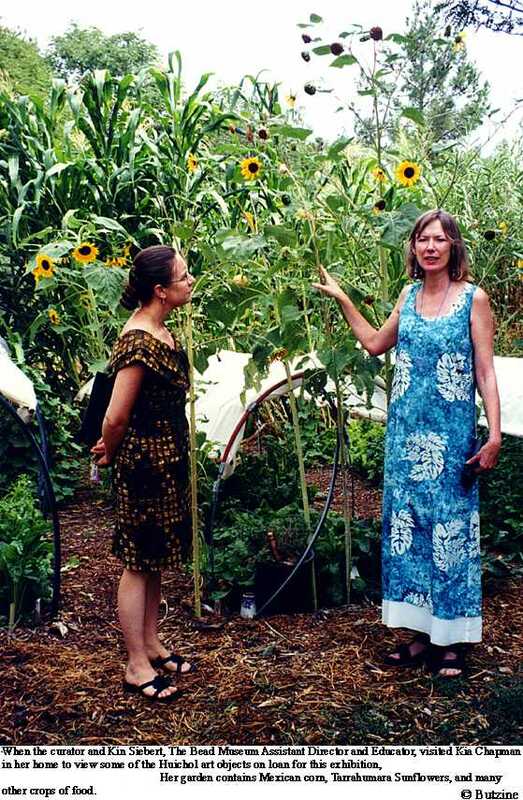 Children need to understand food is grown in a garden and not in a grocery store. The Bead Museum will have a small garden growing outside their facility to begin the journey of discovering the "Huichol Way of Life". The seed/bead metaphor explanation is as follows: the seed is planted one at a time to grow into a plant that feeds the physical body. So too are the beads added one at a time to the artwork, to begin communicating a story that feeds the intellectual and emotional self. 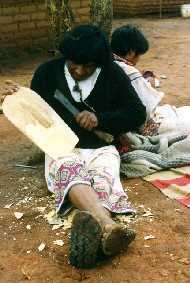 These processes are done by hand. Both need to be carefully tended, in a nurturing manner. Both processes have fulfilling and positive results for the individual as well as the community. By using a rubric with a scale of 1-5 determine the level of learning. The participant begins the project, but doesn't get past a sketch. The student begins beading the project, but does not complete the work. The student finished the project, but many gaps in bead placement are seen. 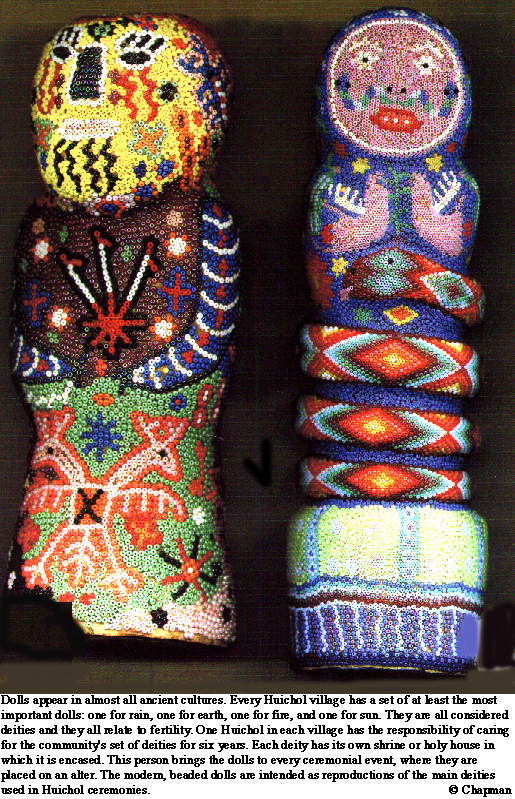 The beaded object is effectively assembled, but the student cannot discuss with the class what meaning it has for him/her. 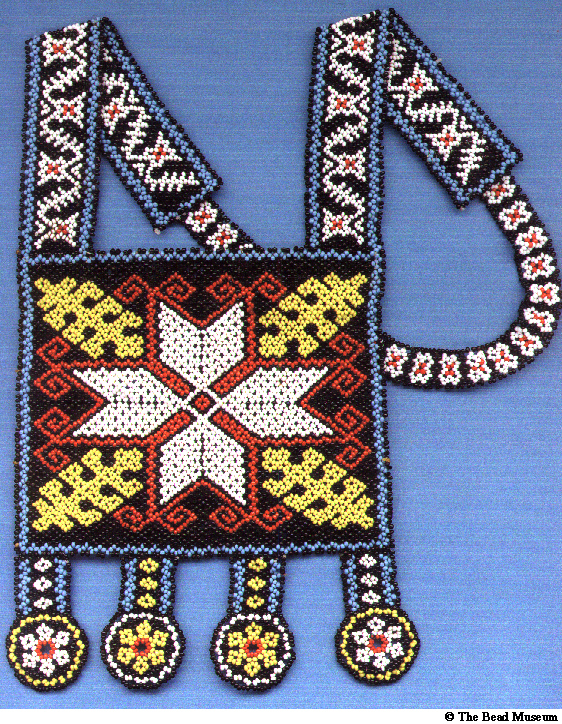 The student has, per instruction, created a beaded object and can give meaning to the designs in the composition. Have the students write three or four sentences about what new information they now understand about the Huichol and their culture.